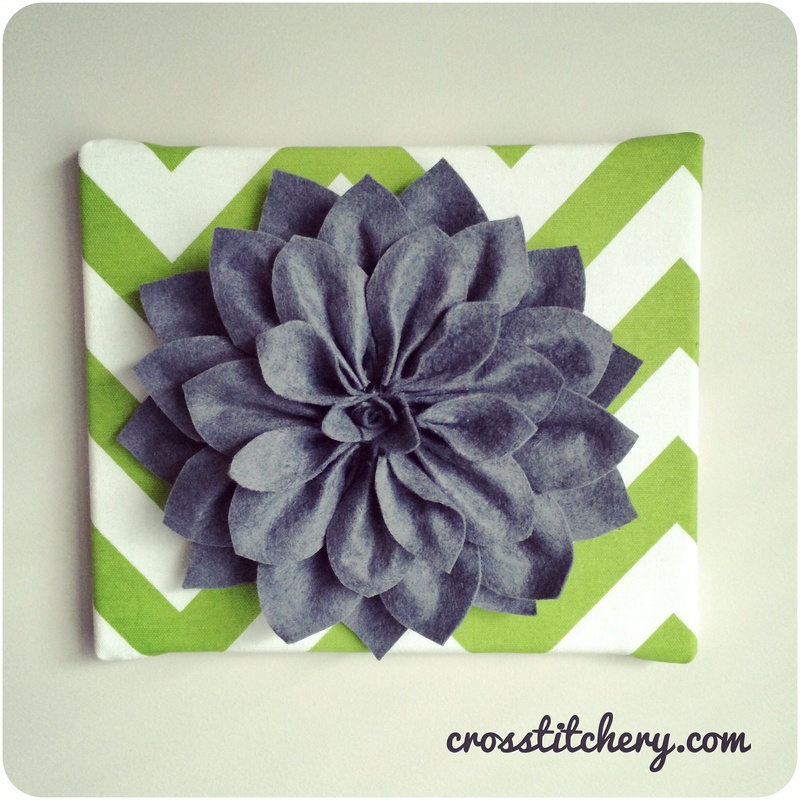 I’m pretty excited to show my latest DIY home decor project – DIY felt flower canvas. I used Carley’s tutorial as the basis for this project. It has fantastic step by step instructions on how to make one of these. I just wanted to share a couple of my own steps which I added in. I made one canvas first off, just to test out Carley’s instructions. I knew I wanted three (I think most decorations look better as an odd number), so I tested the one out first. You can refer to the pictures in the gallery which will detail some of the steps for you. Canvas – whatever size you like, and how many. The one I used was 12″ x 10″. Hot glue your backing fabric onto the canvas. Cut corners out of the fabric though, otherwise you’ll get bulky corners like you can see on one of the photos of the gallery. I suggest adding a little cross to your fabric to mark out the middle. Don’t worry, you won’t be able to see the marks at all .. I found it helped just to space out my petals accurately. Cut rectangles as per Carley’s instructions. I added another 4 of the smaller size though, but I’ll explain why later. Fold rectangles in half put a dot of glue in the middle. Be careful not to burn yourself! Carley’s instructions say to flip the rectangle over and add more dots of glue, but I decided to cut my petals out first. Whilst the rectangle is still folded, cut one side of the rectangle at a curve to create a petal. I liked mine to be more pointed, but you could make them round if you wanted – it’s entirely up to you! Once cut, flip your rectangle and add dots of glue to either side like Carley’s tutorial. Layer them in the centre of your canvas. They will overlap if we stick with the 10 large petals, and they won’t sit perfect (believe me, I tried), but you won’t really see it at the end, so don’t stress. Rinse and repeat the gluing / flipping / cutting process for the 2nd layer. Space them in the centre of the large petals. Rinse and repeat the gluing / flipping / cutting process with 7 of the small size petals. Space these evenly over the 2nd layer of petals. Carley’s tutorial said to only half glue 4 of the small size petals, in order to fill up the centre a bit. For each of my 3 canvases, I used a total of 6-7. I found that 4 left too big a gap, and uneven spacing which really bugged me so I just cut out a few more and half glued them and spaced them until I was happy with them. I also found cutting these final layer of petals at a slight angle made it easier for me to glue my middle piece in. Using your remaining petals, shape a rosebud type centre piece and glue together. There’s no hard and fast rule for this, just shape whatever you think will look good, and will cover the middle section of your piece. Primp and fluff the petals until your heart’s content. You’ve finished, and can now hang your piece on the wall! I hope you find Carley and my’s tutorial helpful. If you have any questions regarding any of the steps at all, I’d be more than happy to help so leave a comment below and I’ll be sure to try and lend a hand – good luck! what a lovely idea, I may try this at some point- maybe with different colours of felt, to jazz it up a bit! Hi can you tell me the sizes you cut the felt. I’ve searched the web. Can’t find that info anywhere. Hi Sarah – oh I’m sorry! The tutorial I linked to seems to have an expire domain, sorry about that! Those sizes depend on your canvas size though, so play around with the sizes if you feel like those don’t work! Good luck – let me know how you go.